"Isabelle Thornton" Le Chateau des Fleurs: Strawberries recipe for the 4th of JUly! Strawberries recipe for the 4th of JUly! I am making these for tomorrow! SO easy! You might have the ingredients already! that looks dead-li-ci-ous:0 your posts are always so colorful and classy, love it!! Those look delicious! I may have to try them myself tomorrow. Those look yummy! I'm making BOTH my 4th of July White Chocolate Pie (seen here: http://mekhart.blogspot.com/2010/07/happy-4th-of-july-pie.html) and my stuffed strawberries (seen here: http://mekhart.blogspot.com/2010/06/four-year-anniversary.html). Good thing I'm a runner!!! Enjoy your 4th! looks so yum!! Happy 4th of July!! 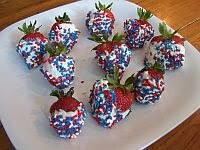 Oh these look yummy...so red,white and blue. You're getting me in the spirit! I think I need some dipped strawberries, too! Anything with strawberries sounds good, Frenchy :). Yipeee ! I loooovve easy. This looks great - Happy 4th!!! Happy 4th of July, Frenchy! we had so much food, I .... well let's just say, I'm still full!